I used leftover smokey roasted sweet potatoes which worked perfectly in this recipe. I love mixing potatoes, quinoa, grains, and nuts into my salads because it makes them feel more substantial. When you feel like your salad is both healthy and substantial you won’t have to go through this internal lunch struggle…. The angel on my shoulder wins with this Sunshine Salad. However, if you must appease the devil on your other shoulder, make some baked apples for dessert. It tastes much more decadent than it really is. Also, I know sunshine is reminiscent of summertime, but this is an autumn salad. The reason I call this sunshine salad is because it is so colorful and fresh. I should really call the dressing sunshine dressing because it is so bright and flavorful. Its also super simple and you probably have all of the ingredients in your kitchen already. Make one recipe of my smokey roasted sweet potatoes. To make the dressing add all of the ingredients into a mason jar and shake until combined. Add salt and pepper, taste, and adjust if necessary. 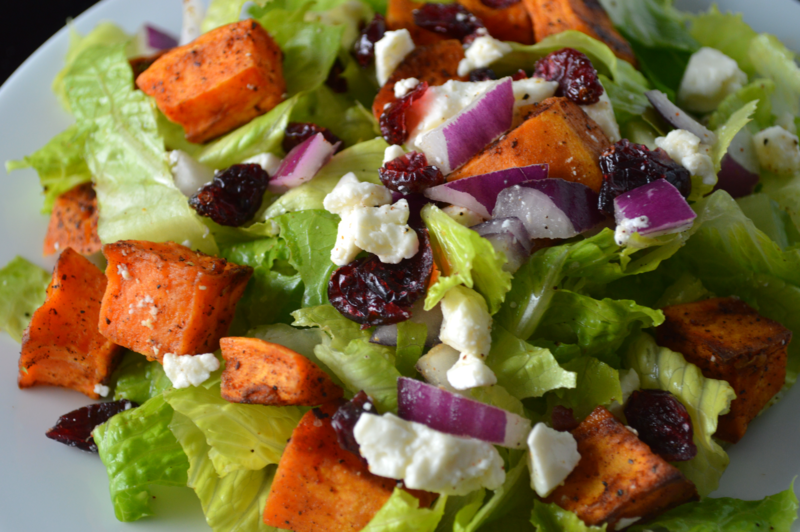 Toss the romaine, onions, and sweet potatoes together and drizzle with dressing. 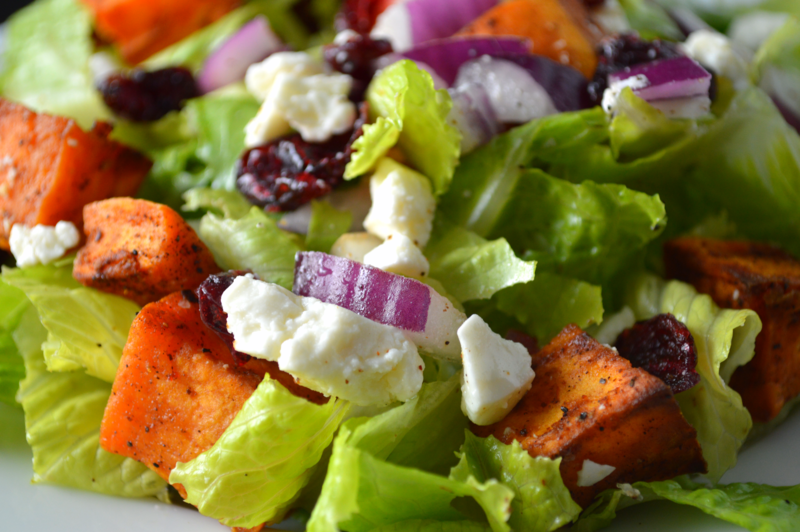 I like to lightly dress the salad and serve with extra dressing and feta on the side. This way, everyone an control how much they want. You an store extra dressing in the fridge for up to a week. 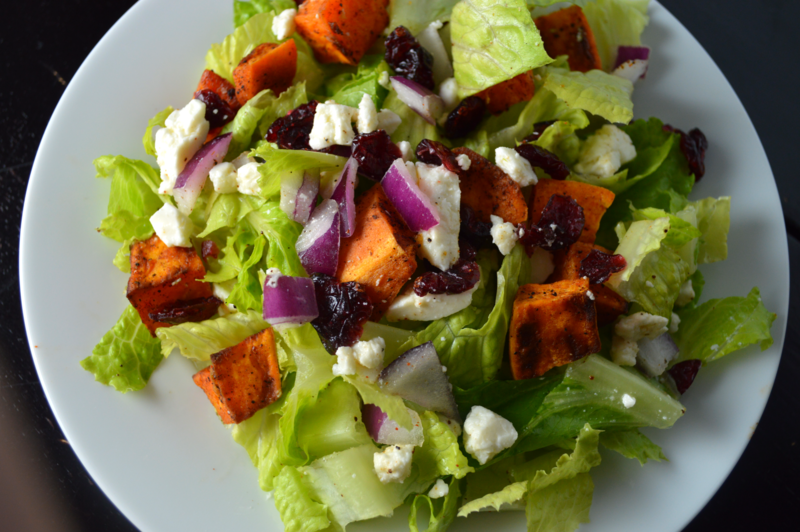 Gorgeous salad, can’t wait to try it with the craisins!